A-Bomb Tests: A diploma for witnesses to Operation Teapot. This jaunty “diploma” certified that Charter Heslep, an assistant to the director of the Atomic Energy Commission, had personally witnessed the tests making up Operation Teapot. Teapot, which took place in the Nevada desert in the spring of 1955, was a series of 14 explosions meant to test new types of devices, try out the effects of nuclear blast on aircraft, and gather information that could be useful for civil defense efforts. Film of the Teapot tests, taken by the Armed Forces Special Weapons Project, can be seen on the Internet Archive. Within Teapot, the smaller Operation Cue focused on the effects of bombs on civilian infrastructure. In this exercise, a model town was set up to chart the effects of the “Apple-2” test. It was Cue that gave us the memorably creepy images of post-blast mannequins and houses that were used in the film Atomic Café. The clip-art-esque cartoon figures scattered around this certificate represent the code names of the various tests (“Wasp,” “Tesla,” “Turk,” “Apple-1,” “Post,” “Bee,” “Zucchini”). A tower, an airplane, and a crater signify the three methods of delivery for the bombs used in the tests. The signatures of various advisers involved in the testing appear in facsimile, while Richard Elliott, the overall director of the operation, signed in pen. The tradition of issuing a certificate to those who had been involved in this kind of weapons test extended beyond Operation Teapot. I originally saw this diploma on the Cold War culture blog Conelrad Adjacent, which paired it with another of Heslep’s certificates. That one named him one of the “Ancient and Honorable Society of H-Bomb Observers” who had witnessed the tests at Eniwetok Atoll. 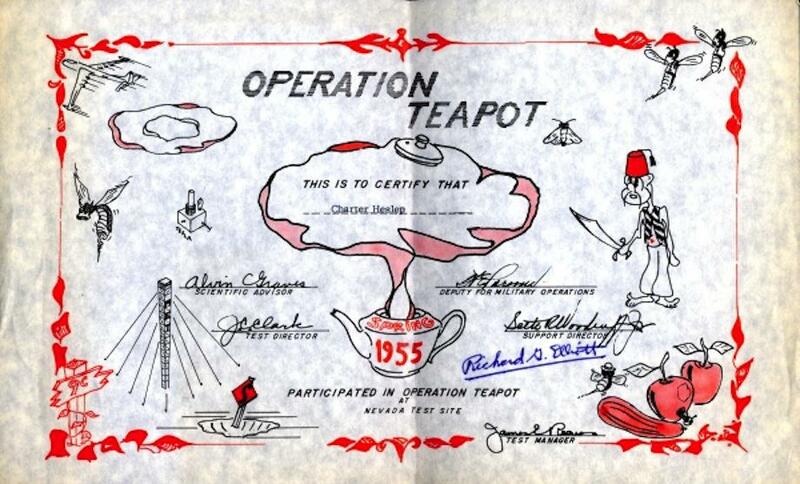 “Operation Teapot,” in Oregon State University Libraries’ Special Collections, Item #1581.